Painter, part of an Austrian family of artists which originated in Cavalese in the Italian Tyrol and worked widely in the territories of the Austro-Hungarian empire. Michelangelo Unterberger was first taught by Giuseppe Alberti (1640-1716) in Cavalese. He is believed to have spent some time in Venice after this, and to have copied the work of Nicola Grassi. After a short period in Klausen (now Chiusa, Italy) where the Apostles in the church of the Twelve Apostles are attributed to him, he was granted citizenship of Bozen (now Bolzano, Italy) in 1726; he painted the Judgement of Solomon (Bolzano, Museo Civico) for the town hall. Around 1730 he worked in Upper Austria near the Inn, and in Passau, where he is known to have created several works for the convent of St Nikola. 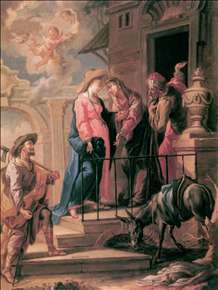 Among the few works from this period that have survived are the Baptism in the monastery church at Vornbach, the altarpiece depicting the Holy Family in the Kurhauskapelle at Schärding, the Martyrdom of St Maurice (1732) in the parish church at Aurolzmnster and the Holy Family and St Leonard in the parish church of St Florian am Inn.